More than 50 young transport workers travelled from all over Europe to Sesimbra, Portugal to attend from 13 to 15 October the first ETF Youth School. The practical organisation and content of the programme was completely in the hands of the ETF Youth Committee that used this opportunity to present the Youth Committee’s work and hold discussions and workshops on the central themes of the ETF Youth work programme. It was the perfect occasion to receive feedback from young transport workers on the work done so far and collect input to identify priorities for the next mandate which starts in May 2017. Earlier this year the ETF Youth Committee has run a survey to get a clear picture of the ETF youths’ views on the impact of the European crisis, climate change and gender equality, the focus points of the Committee’s 2013-2017 mandate. More than 900 young respondents from 27 European countries replied to the questionnaire which provided lots of food for discussion at the ETF Youth School where the first analyses were presented to the participants. The presentations were followed by discussions with external experts on the different topics, namely a professor in labour law from the University of Valencia, representatives from Greenpeace, an Italian public transport company, a trade unionist specialised in climate change and ITF education officer Ali Howes who acquainted the participants with the ETF Gender Training Package. The young trade unionists also received a training on how to campaign with your smartphone, how to record a one shot video which passes on the message in a clear way and allows you to publish it online while you are still at the action and without the need for editing. They practiced by recording videos on the Youth work programme themes. The 1st ETF Youth School also offered the opportunity to announce the winner of the logo contest launched earlier this year. 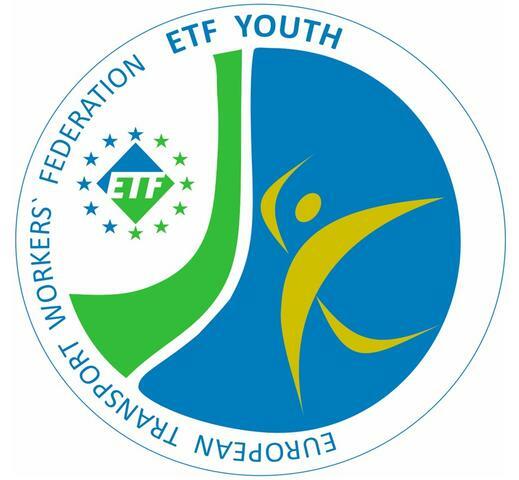 Via social media the ETF youth network was asked to send in proposals for the ETF Youth logo. Sergii Ivanskyi, a young Ukrainian trade unionist who has been active in the ETF youth work since the beginning was the laureate and was celebrated at the social evening in Sesimbra. The ETF Youth Committee and the participants evaluated this first school activity as a fruitful and rewarding event and expressed hopes to organise a similar event for young transport workers every two year. You can get some impressions of the atmosphere via the following web link. This event has been organised in the context of the EU-funded project called “Inclusive and Fair Transport in Europe”. The project aims to provide ETF members with additional tools for better dealing with the current challenges the transport sector is facing, among which the lack of attractiveness for women and young workers.